Son Moran Segoli lives and works in the Negev Desert. Yesterday, on the way to his workplace, he stopped at a petrol (gas) station to fill up. While he was there, three local Bedouin rode up to trhe station, two on one camel, one on the other. 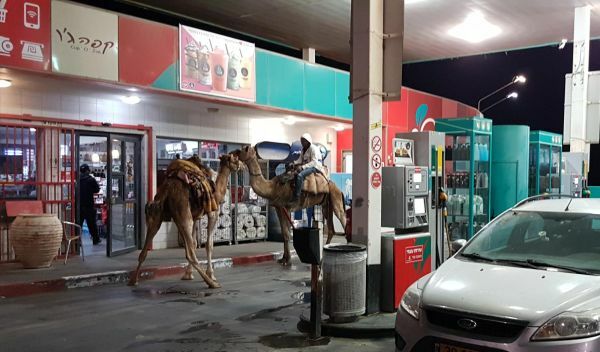 The two got off their camel, went into the adjacent cafe, ordered three expressos to go, and retuned to the camels. The three drank their coffees and continued on their way. Moran managed to take this picture, fill his car, and go on his way.